Term, Permanent (often referrred to as “whole life” insurance), and Universal Life insurance. You choose the death benefit that will be paid upon death. You make payments in to the policy fund. Any amount you pay into the fund in excess of the cost of insurance (the premium) provided by the life insurance contract is invested and builds a cash sum over time. This cash investment enables the value of the death benefit to increase, or allows loans to be taken against the policy, with many people seeing this as a viable income stream for their retirement plans. This type of cover can be very flexible and allows payments to be varied, depending upon the current financial circumstances of the policyholder. Money paid over and above the normal premium can be used to either increase the cash value or increase the death benefit. The three types of policies: TERM, UNIVERSAL, and PERMANENT (or “Whole Life”) insurance offer different benefits depending upon the needs of the policyholder. Permanent (or “Whole Life”) and Universal Life insurance contracts are more flexible, offering tax-free investment potential alongside the lifetime coverage, allowing money to be invested into the death benefits or the investment account. Long Term Care Insurance provides income should you end up requiring extended care. Long term care typically includes rehabilitative care, nursing care, personal and in-home health care. Long Term Care Insurance protects you in the event you have to enter a long term care facility. It can also help should you ever require at home health care assistance. The most popular type of long term care policy is one that provides income to you to provide for any type of long term care service – both in the home and in designated care facilities. Other types of policies reimburse you for eligible expenses or pay a set daily amount for expenses. Life insurance is essential to many families, affording extra security if the unthinkable should happen. The loss of a breadwinner is devastating enough, without having the added stress of worrying about how to cover the bills and mortgage. Changes in lifestyle also determine the types and amount of insurance you need. The amount of life insurance – and the characteristics of life insurance contracts – that you have will likely change throughout your life, depending on your life circumstances. Some of these changes might be getting married, starting a family, changing jobs or preparing for unexpected events. Should you have Term, Universal Life or Whole Life Insurance? 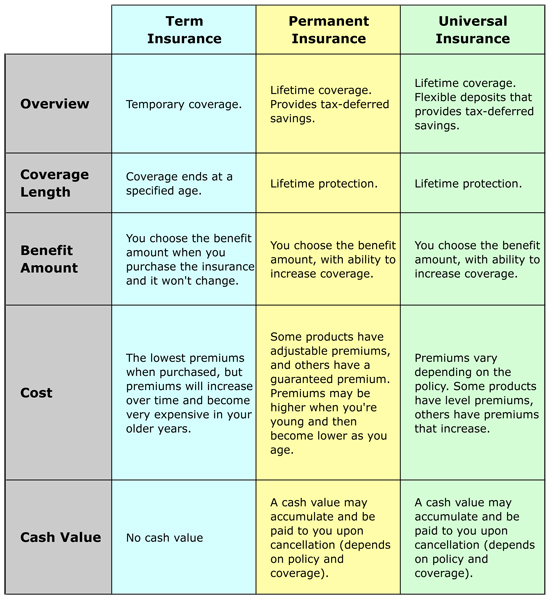 More information on the three types of insurance . . .
To meet modern trends, life insurance contracts can also act as investment vehicles, building up a sum of extra equity over the lifetime of the policy. This can be withdrawn or borrowed against, and usually offers a tax-free sum on retirement or death. Deciding on an amount of life insurance you should have requires careful consideration. A Financial Advisor can help you determine just how much insurance you need, based on your age, your income, family circumstances and obligations, assets owned, and debts owed. How can I make sure my estate is left to family members, and is not depleted by probate court and government taxes? Can we afford college tuition for our children – and how do we save for this, knowing how much tuition costs are spiraling? A Financial Advisor can help you evaluate different life insurance plans and help you determine which policy or product is best going to serve your own unique needs and budget. To assess your financial position and learn about some of the ways in which we can assist you, call us to schedule an appointment. Evening hours are available, and we can meet in your home or in our office. Questions or concerns about how a financial advisor can help? With the average life span increasing, many of us may look forward to 30 years of retirement or more. A Financial Advisor can show you some of long term investment strategies and vehicles to help you meet your retirement savings goals, minimize your estate tax liability, and provide security for your spouse/family. Good estate planning identifies what will happen with your home, business, investments, life insurance, retirement plans, and other property when you become disabled or die. How much retirement income will my RRSP provide? How much can I contribute to an RRSP? What will my RRSP be worth at retirement? What happens if I withdraw funds early from my RRSP? How do I compare any taxable vs non-taxable savings? Question or concern about Retirement & Estate Planning?